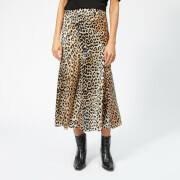 Women's high-waisted maxi skirt from Diane von Furstenberg. Cut from luxurious woven silk with a flattering, draped silhouette, the silk skirt is adorned with the label's custom Baker Dot Small print in sienna brown, and sits high on the waist with a banded waistband. The full skirt falls effortlessly to ankle length. Finished with a concealed zip fastening and hook and eye closure to the rear.